Caribbean Sculpture Park — UTech, Ja. 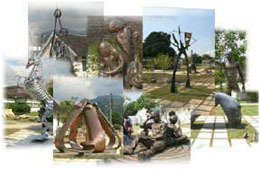 Located at the University’s Papine campus and the only open-air museum of its kind in the English-speaking Caribbean, the Caribbean Sculpture Park facilitates the sensitization of the UTech, Jamaica community to the arts. Designed by the Faculty of the Built Environment the Park takes the format of a Japanese Rock Garden. The layout was carefully planned with each work of art defining its own ‘space’. The location of the park in the central part of the university, traversed by many pedestrian routes, allows students to experience the sculptures, from afar, close-up, or for some, from within. Students can interact with each piece of sculpture on a one-to-one basis. Students can sit, study, read, and appreciate the general environment of the park, where there are footpaths and benches, clusters of shady trees and grassy areas, all coming together to create a tranquil setting in the ‘heart’ of the University. Added to this, the park provides students with meaningful exposure to the work of different professionals in the arts. The park itself has a soul or a sense of presence, which students intuitively and instinctively tap into, both on a conscious and unconscious level, consequently providing a sense of balance and well being in the students. The sculptures are of life size and are done to scale in harmony with the physical and natural environment. The primary focus of the Park is on the artistic expression, vision and cultural contribution of each piece to humanity, linking the Arts with Technology. The material used for each sculpture is not only artistic but also durable, therefore evolving with age. The Caribbean Sculpture Park is the brainchild of Pat Ramsay, Former Director of Arts & Culture. It was designed by David Harrison, Chartered Architect and Principal Lecturer of the Faculty of the Built Environment.